Today’s Boston Globe reports what was possibly an inevitable story: that the 99-year-old landmark Filene’s Basement store in Downtown Boston will shut for 1 to 2 years while the building is redeveloped. Unlike most of the tamer, modern Filene’s Basement stores that opened as part of the chain’s expansion, the original downtown Boston store is a true “basement,” with few adornments. Clothes are heaped into bins, there is no attempt to “merchandise” the space, and markdowns are taken automatically depending on how long an item has been in the store. The original Filene’s Basement is also the home of the famous “Running of the Brides,” an annual bridal gown markdown sale that frequently attracts national attention. Filene’s Basement is one of Boston’s major tourist destinations, and at this point may be its top retail-related tourist destination. Unfortunately, the loss of Filene’s, its namesake chain upstairs (the two long ago split apart, though they maintained some synergy here) is forcing some changes. After the Federated/May merger, the Filene’s flagship store closed its doors because it was smaller and more outdated than the Macy’s flagship across the street (which was itself a Jordan Marsh store until 1996). Vornado Realty Trust purchased the vacant Filene’s building with the intention of redeveloping the entire block and replacing the store with a 38-story tower while mercifully maintaining the historic facade of the building. Unsurprisingly, it’s going to prove much too difficult to keep the Filene’s Basement store open during construction, and while the current space–which is a dark, claustrophobic room with low-slung ceilings–isn’t normally the type of thing that inspires much nostalgia, it almost certainly will this time. It will be interesting to see how this impacts the already-troubled Downtown Crossing shopping district, which also recently lost both Barnes & Noble and HMV, and suffered from the loss of the enclosed Lafayette Place shopping mall in the late 1990s. Most of the downtown retail activity in Boston now occurs just to the north, at the tourist-oriented Quincy Market/Faneuil Hall complex, or a mile to the west in the increasingly-successful Back Bay retail district. Many are skeptical the store will ever reopen, given the shiny, high-end prototype store that the chain opened there just months ago, between Newbury and Boylston Streets. Nooooooo!! 🙁 I have so many memories of shopping at Filene’s Basement while I was at a student at Emerson in the late 80s. The whole Downtown Crossing was an awesome place to be back then–a 5-floor Strawberries, a rock/head shop called Stairway To Heaven, Baker’s Shoes, lots of cute little boutiques, and of course, Jordan Marsh and Filene’s and Filene’s Basement spread over four or five blocks closed to car traffic. Almost all of that gone now from when I went back to Boston a little over a year ago. 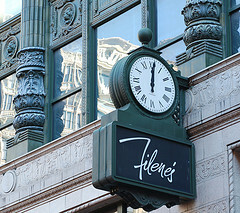 Now Filene’s Basement is being shut for a “makeover”. Yeah right. As for the chain in general–big deal, I can do just as well at Burlington Coat Factory. Where else but Filene’s Basement could I find a Betsey Johnson blouse for $12? Filene’s Basement (the real one) RIP. my grandmother, Florence Wall, was a buyer in Women’s clothing at Filenes and she secured my first retail position in 1962 as gift wrapper in “The Basement” at Christmas. I moved up to stock clerk in ladies dresses, then I was able to wear some of the dresses around the store to show them off. I loved traveling from Somerville to Boston via Lechmere station. It was my first opportunity financial independence. Sam, yes…in fact they were related until only very recently, though the Filene’s Basement chain was always a separate entity. They’ve been doing that in Boston for years; nothing new there. Although at least in Boston, they’re a little more cognizant (sp?) with their history. So…is Filene’s Basement basically the clearance/outlet center for the former Filene’s dept. store?? I was there in late September. Amazingly enough (to me, at least), it was my first trip to Filiene’s Basement. At first I wondered how I’d even get inside, but the old main Filene’s was still open in its “clearance” phase. Very depressing, actually…such a nice old store all compressed into one floor, with merchandise trying to be moved out the door everywhere. But it still had that old department store “feel” to it, with its high ceilings, staired entries, and musty smells. After wandering around on the first floor a while, I decided to see what all the hype was around the Basement. I went down to the first basement level on the ancient escalators and just walked around. And then I went to the lower basement level and just walked around. And then I left. I looked around at various things, but nothing struck my fancy. Really, I wasn’t overly impressed, but I can see why people shop there. The atmosphere was very…basementy. Low ceilings, exposed pipes…very cool, in my opinion. After taking pictures of the clock and the carillon (how many other department stores do you know of that have their own carillon? ), I went across the street into macy*s. I expected it to be a little grander, but it was hard to tell that I wasn’t in my local macy*s in the mall. The real kicker was the plaque outside telling the history of Jordan Marsh and how macy*s was a great company with an equally great history who would continue to uphold the traditions (or something to that effect). Unfortunately, I suppose that’s the way things go these days. So long to an original. We used to have a few Filene’s Basement stores around Connecticut. They weren’t quite “basements” but the term was more or less used to describe the clearance style store. I thought the chain died long ago when I found that a revisit to the Holyoke Mall still had one. Unfortunately, they closed that one. My dad used to drag me in the Corbins Corner store when I was a kid; they did in fact have a lot of nice and oddball suits at what he considered to be pretty good prices. I remember that store always being packed with stuff and generally messy. Supposedly, some exist today, but the company who owns them now are purging their locations. Speaking of Strawberries, it’s funny how it ended up in this topic. They, like Macy’s, have sought to rebrand all their subsidiary stores under the silly “fye” name just recently. Like the GameStop (former EB) chain, expect two of each in your local mall/off mall grounds. This is a big loss. Filene’s Basement may not have looked like much, and the off-price concept is now as close and ubiquitous as your local T.J. Maxx, but it revolutionized retail. I hope it reopens soon. Actually, Filene’s Basement the company is in the middle of a resurgence at the moment. They overexpanded (I think they went as far as Chicago for a bit?) in the 1990s and nearly went bankrupt, and were forced to carve themselves down to only a handful of stores. The leaner company (which is now owned by Value City of Columbus, Ohio) has come back and is again rolling its store concept out to more places. Given that the TJX brands are so ubiquitous, they’re trying to carve a niche by selling high-end merchandise that’s been marked down; things like Prada, Hugo Boss, etc., and are positioning themselvea as a higher-end alternative to TJX. To answer the question asked earlier by “anonymous:” Yes, Filene’s Basement literally began as a clearance basement for the Filene’s flagship store in downtown Boston, and remained as such for many, many years. In fact, this particular location was operated separately from the remainder of the Filene’s Basement chain for its entire life so that it could continue its original mission, and as such is very different from any other Filene’s Basement locations that you may have been to. It’s truly a bargain basement–there is no flashy branding or chain-like efficiencies; it’s a *basement*. Really you wouldn’t know looking at it that it was even the same company. And to reply to XISMZERO about the Strawberries-to-FYE branding: let me chime in at how saddening I find that. Full disclosure: I used to work as a manager at Newbury Comics. I’m a big music-store guy, and really never set foot in FYE-type places other than to dig through their cutout or used bins; Newbury and other indie stores were always far, far better. However, Strawberries was at one time New England’s most storied independent music retailer, blanketing the area much in the way that Newbury Comics does now, and they were the “good” music store to go to in many cases. This was the case even into the 1990s: Strawberries was way, way better than those crappy music chains like Record Town. Unfortunately, they were acquired by TransWorld, who has slowly and painfully sucked the life out of them until now, when they’re wiping their storied name away. Let me say this: I’m not sure there has ever been a retailer, in any vertical, who got so far in their industry by being truly the absolute *worst* at what they do than FYE. Eliminating the Strawberries name is just the latest step in that process. A few things to clear up here…. The store Filene’s Basesment store is being TEMPORARILY closed during renovation of it’s building. The 1912 Filene’s building is considered historic it will not be demolished,nor is the large tower going in or on top of that building. That building will be renovated in other words only the interior will be revamped the facade will remain as it is. the other Filene’s buildings from the 1950s and 70s are not considered historic, so in turn they will be demolished and in that area is where the large tower will be built. Since I plead guilty to bringing up Strawberries in this topic (LOL), let me add this…I’ve never been much of a Strawberries fan either except for two locations: Kenmore Square and Memorial Drive in Cambridge. Both had selection that I found almost equal to Newbury Comics. I know the Kenmore Square location was done some time back. But I was especially disheartened to recently discover that FYE closed the Memorial Drive location last year. 🙁 When I lived in Boston, and I was too lazy to venture downtown from Brighton, that’s where I went. As long as we’re bashing FYE, let me venture a little further down south and add Compact Disc World in NJ to the list of chains they’ve destroyed. For those unfamiliar, CDW was an indy chain with about a dozen locations littered throughout the state. Only three were left last I checked. By my last trip to one of the surviving locations (Eatontown) in 2004, much of the charm was scraped away; their discount club had become useless. They’re still there but I haven’t been back since. Caldor, you managed a Newbury Comics? I officially love you now! In fairness, it was middle-management, but yes. Newbury Comics are what FYE are not. I abhor FYE for its overzealous brand of junk, overpriced selection they’ve been selling for years like many probably do. But Newbury is a great store for all it’s unpredictabilities. I hope they can secure more Connecticut locations while they currently only have one; at the Buckland Hills Mall (now open, but not as great or big as the Manchester, NH and Cambridge, MA stores). This is truly sad news for the city of Boston. Since Filene’s Basements closed in Connecticut I have been visiting them during my annual trips to Cape Cod (Cape Cod Mall in Hyannis has one across the street) and to the orginal one at Downtown Crossing. I was just in Boston a few weeks ago and stumbled apon the new Filenes Basement store near Newbury Street which is nice but it is not the same. It resembles the ones in New York City and quite honestly those stores have a lot of comeption…the flagship store is unique. Even though the flagship store has clothes and accessories strewn all over the place there are still better bargains and items to buy there then in their newer version of stores. I did read that the story will be closing temporarily for 1-2 years but that is still a big risk to take. Management could decide on bailing on the site, rent may go up, etc. and thus its a big gamble. We can only cross our fingers and hope for the best. Also on the note of Downtown Crossing in general…I personally love it and we can only hope for the best. Downtown Crossing is a more down to earth retail district as opposed to Newbury Street or the Prudential Center and even though some stores have closed Marshalls, TJ Maxx, Eddie Bauer, Macys, H&M, FootLocker, Champs, Mens Warehouse and Express (to name a few) are still located at downtown crossing. Also the Barnes & Noble at Downtown Crossing closed recently but I am pretty sure that closing came from the fact that there is a much larger and more modern Barnes & Noble about 3 buildings down from the Barnes & Noble. I don’t have a personal comment, but I found this interesting and thought of sharing it with you all. This exerpt was taken from the “Grand Emporiums, Illustrated History of America’s Great Department Stores” Copyright 1979. I’ve never been to the Boston store, but I remember the Filene’s Basement in DC was also a true basement, with the exposed pipes and all. It’s over by the Metro Center station, and there were some great bargains. The Filene’s Basement here in Atlanta might as well be Marshall’s or TJMaxx. It just isn’t the same. Downtown Crossing still seems fairly busy and occupied, despite the closing of Filene’s Basement. I was in Boston for an internship at the short-lived BostonNOW newspaper and was in Downtown Crossing twice a week, and the place was always busy. Filene’s/Filene’s Basement is still vacant, unfortunately, and Strawberry’s is an FYE. As someone who visits record stores — both chain and independent stores — quite often, I find FYE is a major disappointment. When I grew up in Philadelphia, I went to The Wall at the Gallery and Tower Records (first on South Street and then at Broad and Chestnut) and both chains were gobbled by FYE. The one at the Gallery was extremely disorganized (and it still probably is, assuming it is still there) and I never visited the other locations. But, when I saw FYE appear in New England — at first in the old Strawbeerry’s location and then at Buckland Hills — I was disappointed. Basically, as someone who still buys CDs and cassette tapes, I found they have next to nothing. Tower used to have a good import section and large Classical and Jazz sections. Even the Tower in Philadelphia used to have bands come to their store for record signings. The Wall just had a bit of everything, but no “junk,” save for a VHS copy of Grease 2 I once found there. I even still own a Smashing Pumpkins album with one of those old Wall stickers on it. And, with many independent stores closing, are those who still buy records and tapes stuck with FYE? Shoot, it just makes me want to start using iTunes now. Even with 5 floors at the former Strawberry’s in Boston, there really just isn’t anything good there musically. Check out http://www.voicesfromthebasement.com for trailer on documentary about the history of Filene’s Basement that is premiering next month.